You'll enjoy a bit of beach vacationing at Bellevue Beach and Ispoinen Beach and Sauna. Deepen your sense of the past at sights like Uto and The Church of the Holy Cross. Get out of town with these interesting Turku side-trips: Raseborg (Hagen - Ramsholmen - Hogholmen, Ekenas Old Town, & more), Nuuksio National Park (in Espoo) and Rauma (Old Rauma, Rauman Merimuseo - Rauma Maritime Museum, & more). Spend the 17th (Sat) exploring nature at Teijo national park. 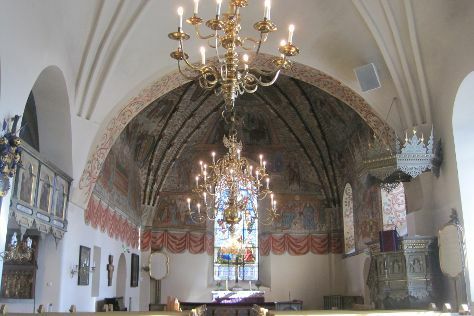 The adventure continues: explore the historical opulence of Turku Castle, explore the ancient world of Aboa Vetus & Ars Nova, take in the architecture and atmosphere at Nagu Church, and tour the pleasant surroundings at The Archipelago Trail. To find where to stay, maps, reviews, and more tourist information, use the Turku trip maker . If you are flying in from Germany, the closest major airport is Turku Airport. August in Turku sees daily highs of 23°C and lows of 12°C at night. Wrap up your sightseeing on the 5th (Thu) early enough to travel back home.